"By God, England will not fall while I am Queen." Call it Elizabeth: The Two Towers. 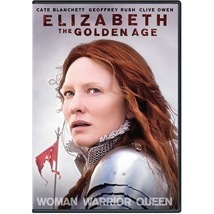 Director Shekhar Kapur follows up his critically-lauded 1998 film Elizabeth, which placed the story of England's most celebrated queen into a personal, feminist context and gave Cate Blanchett her first powerhouse role, with a historical epic of sweeping scope and elaborate wigs. The first movie was a rather intimate story of romance and political intrigue. The second, obviously influenced by the fantasy film boom of the last decade, aims higher, with a cabal of international assassins, shadowy villains, a naval battle, and a St. Crispin's Day speech or two. Neither movie considers historical accuracy a top priority, but at least the former doesn't feel like it's trying to woo the fans of The Lord of the Rings. Some years after she has taken the throne, Elizabeth is a popular ruler, but her country faces turmoil from within and without. King Phillip of Spain (Jordi Molla) takes a break from lurking in the shadows of a gothic cathedral to kick off a series of political intrigues, seeking to bring the Inquisition to the heathens of the Church of England. Mary Stuart (Samantha Morton), who believes the throne is rightfully hers, is also causing problems as she and at network of spies attempt to undermine Elizabeth's rule even while isolated in a minimum security island prison. That's not to mention the fact that many of England's citizens have something of a problem with that whole denouncing their faith thing brought about by the queen's father. Yes, it's a tough time for the queen, not that you'd know it, as she seems to have little more than boys on the brain in Elizabeth: She's All That. The quite interesting intrigues described above are but subplots, and the majority of the film concerns itself with a soapy love triangle. Elizabeth is intrigued by Sir Walter Raleigh (Clive Owen, woefully miscast as the dashing adventurer), who wants her to finance his expedition to the New World. It's not for a queen to romance a pirate, but that doesn't stop Elizabeth from turning the man into more or less her closest confidant, to the point of discussing matters of state with him between romps on horseback. Raleigh, meanwhile, would rather woo someone not wearing 25 pounds of orange poodle hair, and begins an affair with one of the queen's ladies in waiting (Abbie Cornish). Elizabeth gonna be pissed, y'all! It's not that this stuff isn't entertaining on some level, but to see some rather complex political maneuvering relegated to poorly developed background scenes (Geoffrey Rush returns but has hardly anything to do as the queen's advisor Sir Francis Walsingham) is disappointing. Mary Stuart's attempt at a coup should provide enough material for any film, but it barely registers�Kapur spends more time on lavish sequences of Elizabeth in ludicrous concoctions of lace and ruffles; like Madonna in concert, she has a new outfit in every scene and her moral struggle over what to do about the relative who tried to have her killed is given less regard that which wig looks best with that satin neckpiece. Cate Blanchett, who managed to garner a second Oscar nomination playing this role, is effective in any given scene, but the film is prone to such wretched excess that it seems she spends most of her time either fluttering her hands with nervous theatricality or shouting to the heavens, going for the highlight real with every line of dialogue. The production design and aforementioned costumes provide more substance than the paper-thin supporting characters. Elizabeth was interesting because it humanized a historic figure and injected some zest into the genre; Kapur's weird trappings (who can forget the transformative finale that strips the queen of her femininity before our eyes?). The Golden Age has none of the good bits. As the final scenes unspool, we watch as Elizabeth dons fashion-forward armor and gives a rousing speech before returning to her castle to hover symbolically over a giant map of the world painted on the floor while her robes billow around her like Batman's cape, intercut with an improbably-staged naval battle, and realize we have just witnessed nothing less than a stunning MTV historical montage. Who said history had to be boring? Image Transfer Review: The lush cinematography, with its varying levels of grain, vibrancy, and lighting, comes across quite nicely on DVD. The transfer shows good detail with minimal artifacting and no apparent edge enhancement. Audio Transfer Review: The 5.1 mix runs the gamut, with a strong presentation of dialogue and music during the softer scenes and appropriately bombastic battle symphonics during the climactic sea war. Lots of surround action and a good presentation of a somewhat overblown score. Extras Review: There are more extras here than the back of the box would have you believe, most of them providing an interesting, if rather cursory, look at the production of the film. Director Shekhar Kapur starts us off with a chatty commentary track, during with he provides plenty of information on the production, the attempts at recreating history accurately, and the moments that fudge the facts. He's a lively speaker, if the commentary track is your thing. A reel of eight deleted scenes runs a bit under nine minutes. The majority of them beef up the conspiracy against Elizabeth and the involvement of Mary Stuart, a subplot in the final film that really should have been the main plot, and might have been if some of this material were reinserted. Though I still could do without the artistically framed close-up of her detached head. The rest of the extras are broken up into brief featurettes. The Reign Continues�Making Elizabeth: The Golden Age (11m:23s) is the usual fluff piece, full of brief cast and crew interviews that really tell you very little about the production. Inside Elizabeth's World (07m:24s) is a bit more engaging as it explores the production design and set construction. And for some reason, the piece is sponsored by Volkswagen. Commanding the Winds: Creating the Armada (12m:03s) is the best extra, a look at what it took to construct a fleet of ships for the climactic battle, from the wood and nail construction process through the CGI manipulation that put them on the ocean. Towers and Cathedrals (10m:43s) is all about the work that went into scouting out real-world historical buildings that fit the film's themes (whereas Elizabeth was dark, The Golden Age is bathed in light, which meant finding a suitably bleached castle for the queen). Elizabeth: The Golden Age is, on one hand, a soapy costume drama, and on the other, a scatter-shot historical epic. With lurid visuals inspired by Rennissance paintings, Shekhar Kapur's follow-up to his 1998 Oscar-magnet is almost a cartoon. The plot is loosely sketched, its idea of Elizabeth is hopelessly anachronistic, and the performance at its center feels needlessly busy. But the pretty pictures mean it's also rarely boring.